Powerful, bold, passionate, good fortune — these are a few of many words and phrases that describe the color red in countless countries and cultures. With this intense color, red isn’t for the weak of heart! Not only do words describe the color red, but objects as well, such as the stop sign on the street corners and red roses that represent love and passion on Valentine’s Day. As part of our Color Chronicles, we’re dedicating the first color of the rainbow with lovely red items handmade by indie artisans. From accessories to edibles, you’ll discover a wide array of various red colored items that represent our title, “15 Shades Of Red.” Whether you’re looking for a gift for someone who loves this incredibly flashy color or something red to go with your wardrobe, our guide has a little something for almost every occasion. 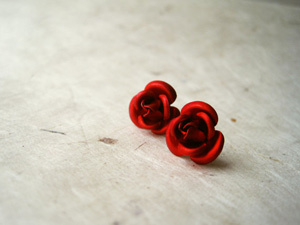 Grace yourself with Piggle And Pop’s red rose stud earrings! This beautifully detailed rose earring pair is made of surgical steel posts and finished with a red colored metallic matte. Perfect for a Valentine’s Day present or everyday accessory, these red rose stud earrings are sure to add a touch of bold, feminine elegance to your attire. 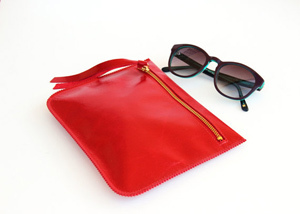 Carry your everyday necessities in Leah Lerner’s red leather clutch! Crafted from topnotch quality Italian leather, this red leather clutch gives you that bold touch to plain, everyday outfits. With a smooth, shiny exterior, you won’t need to worry about clean-up when this clutch gets dirty. A tassel zipper pull attached to the gold zipper adds an extra feminine design to this clutch. Add sparkle to your living room with Amelia Kay Photography’s abstract photograph pillow cover! 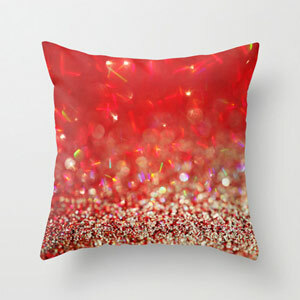 This pillow cover features Amelia Kay Photography’s original photo, “Red Craze,” which displays an eye-catching, bokeh-designed picture of falling glitter. You can choose this pillow cover in several sizes, from 16×16 to 20×20. You can also choose the option to have a pillow insert in the pillow cover, which gives you the freedom to use your pillow right away! Wrap your coffee mug in Lilac Gifts’ grey mug cozy! 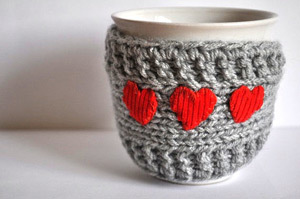 Knitted with red hearts, this adorable cozy is a great symbol of love for coffee, tea or other warm beverages. A button is attached to the cozy, which allows you for better fitting and security on a standard-sized mug. Find more red heart clad items in Lilac Gifts’ shop! 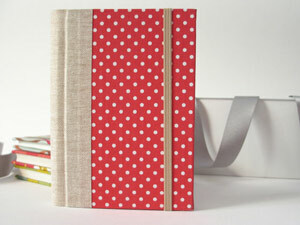 Keep your daily to-dos, plans and goals in Arte & Luar’s stylish red and white polka dot 2014 planner! This handmade agenda is designed as a weekly planner to provide you with an easier way to track your errands, school assignments, etc. Made with a hardcover that has been covered in red and white polka dot cloth and lined with a book cloth along the spine, this sturdy planner will last you throughout the year. An elastic band is attached to this planner to further secure your daily plans. Monthly calendars, note pages, year plan, and many other features are included in this lovely planner. 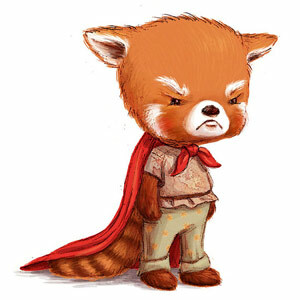 Grumpy Cat may be all the craze nowadays, but Kayla Skogh’s Grumpy Red Panda art print is an original, adorable character that has been featured in Kayla Skogh’s children’s stories! Draped in a red cape and simple clothing, the Grumpy Red Panda is a wonderful, unique nursery wall decoration for your little man. This print comes in a 8×8-inch size and with a white border for easy framing. You can find other red panda characters in Kayla Skogh’s shop. 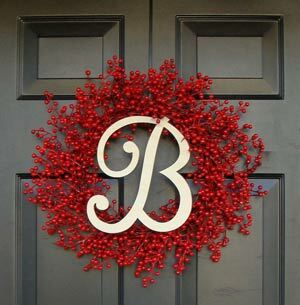 Decorate your front door with Elegant Wreath’s lively red berry wreath! 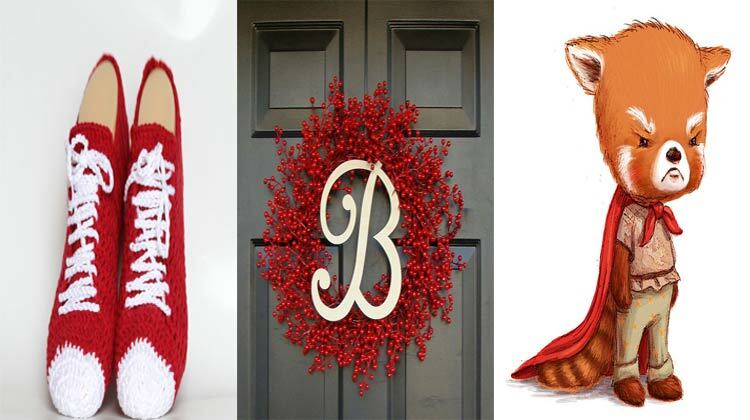 With a personalized, wooden monogram, you can make this wreath special to your home since you can use your family’s last name as the initial. Made with weatherproof red berries, you can hang this wreath on your front door year round without worrying about it wearing down! Add a Native American flair to your home decor with Fletcher And Fox’s red arrow bouquet! 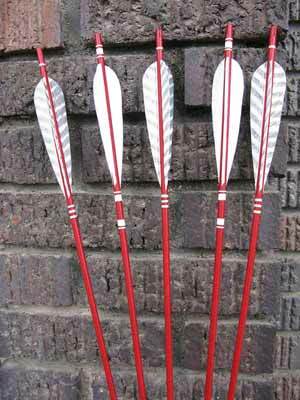 This set includes five wooden arrows that have been hand-painted in red and have bands of various designs. You can place these on a living room wall or bedroom or even make it into a present for an archery or Native American history fanatic! Toss out your ordinary black leggings and adopt XSILK’s red and black hand-dyed ombre tights for your evening wear! Knitted into comfortable yet sturdy tights and hand-dyed with an ombre pattern of black to fiery red, these tights look great with black clothing, such as black plaid shorts, miniskirts and dresses. Dare to be different and wear XSILK’s striking, hand-dyed tights! Embellish your little black dress with Dekkoline’s hemp necklace! Threaded with red, wooden beads, this hemp necklace lays close to your neck in a choker-like way and gives your outfit a wonderful touch of rustic elegance. 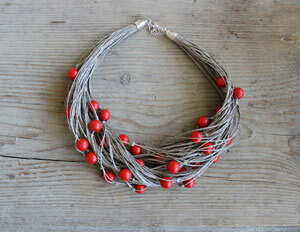 The multi-strand design of this hemp necklace gives this accessory a modern appearance as well. Beautiful flowers aren’t just for display! 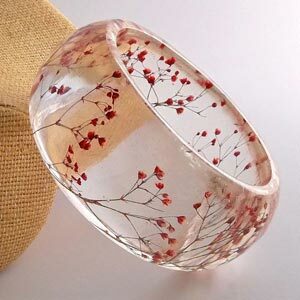 With Spotted Dog Farm’s pressed red baby’s breath flower resin bangle, you can wear stunning and quaint flowers as accessories for life. This curved bangle contains fresh, authentic red baby’s breath flowers and is a whimsical, ladylike accessory to embellish your casual outfits, dresses and more. You can also get this bangle personalized with an engraving, making it a wonderful present for a flower lover, gardener, nature fanatic or someone who just adores unique accessory pieces. 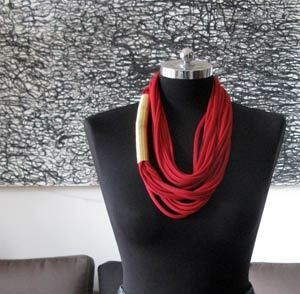 Instead of a necklace, wear Eninaj Design’s multi-strand, infinity scarf! This dainty scarf can also be a necklace-like accessory for your outfit since it’s thin and has multiple strands that are held together with a long gold coil. Modern and chic, this uniquely designed infinity scarf looks great with simple and formal outfits, whether for work or everyday, personal outings. 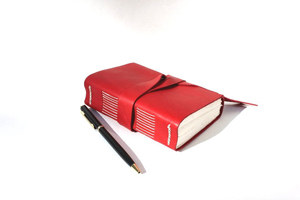 Jot down your thoughts and ideas or doodle away in Wee Bindery’s sophisticated red leather journal! This journal is made with over 200 pages of high quality Italian text paper that allows writers and artists to use any drawing or writing utensil, from ink pens to pastel. Hand-stitched with a Medieval binding technique, this journal has a slight, old time-y flair to it. A leather tie comes with this journal to secure these secretive pages. Create your own sneaker slippers with Etty Geller’s crocheted sneakers pattern! 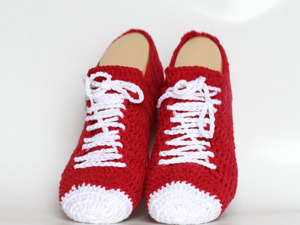 With these red crocheted sneakers, you can walk around your home without getting any dirt on your carpet. Your feet will also thank you for keeping them safe and warm in these crocheted slippers. This pattern includes detailed directions for you to make these sporty sneakers for yourself or even as holiday or birthday gifts for friends and family! Indulge in a sweet treat derived from a classic cake flavor — Flour Loves Sugar’s red velvet white chocolate cookies! 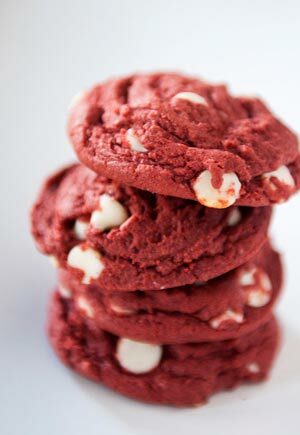 With a red velvet cake cookie batter mixed with sweet morsels of white chocolate, this decadent treat listing comes with two dozen cookies in FDA-approved cellophane bags. Whether for a party or for a reward snack for yourself, these cookies are sure to please any crowd! Whether for love or for power, red represents a wide variety of beliefs, ideas, emotions and more. With our red-colored item list, though, and with February right around the corner, Valentine’s Day is almost here, so you can find a gift for your Valentine(s) from our list. After all, red is the color of love and passion, so what can be more fitting than red-colored items for Valentine’s Day presents? Enjoy this fierce color, and have a Happy Valentine’s Day! Stay tuned for our next Color Chronicle: 15 Shades of Orange!